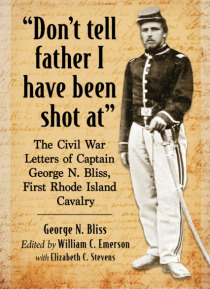 i Captain George N. Bliss of the First Rhode Island Cavalry survived some 27 actions during the Civil War. Midway through the war, he served nine months at a conscript training camp in Connecticut, where he sat on several courts-martial. In September 1864, in a skirmish at Waynesboro, Virginia, he single-handedly charged into the 4th Virginia "e;Black Horse"e; Cavalry. Badly injured an… d taken prisoner, he was consigned to the notorious Libby Prison in Richmond. A colorful correspondent, Bliss set out in detail his experiences in letters to a close friend and sent dispatches to a Providence newspaper. His candid writings are rich with details of the war and his own opinions. The editors describe how, following the war, Bliss sought out the Confederates who had almost killed him and formed friendships with them that lasted for decades.